The more we sweat in training the less we bleed on the battlefield. As infantry soldiers we firmly believe this motto. We are always at the forefront of activity on the battlefield and need to train in a realistic and challenging environment to achieve our best when it really matters. This is exactly why Gallipoli Group from the 2nd Battalion of the Royal Gurkha Rifles deployed to Lavarack Barracks in Queensland in Northern Australia, for an overseas exercise. For the newer members of 2RGR like me, it was our first overseas exercise. I must admit that I was a little bit nervous before we left because we hadn’t ever experienced such a long exercise before and were going to be using live rounds for the majority of the time. 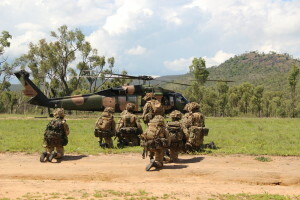 Also we would be on exercise in Australia, a completely new environment for more than one month. on the 1st of February and started the section level phase after a few days of RSOI. During RSOI we zeroed our rifles and practised our navigation skills in the new environment. In my opinion the section phase was the toughest phase. During the section level, our ‘advanced to contacts’ were conducted over 3 days. All the advances were extremely challenging and were some of the hardest attacks we have ever done. The ground was horrible. We had to advance up very big hills and there were huge rocks everywhere. Despite this, we still achieved our goals. Little did we know the toughest advance was yet to come. On the last day of the section phase, we had to do a long distance march in the night. All the sections were on their own moving through the darkness to cover almost 28K. Our section commander and the other seniors all encouraged us and gave us their full support that enabled us to reach the finish which was a camp where we had some time to recover. Refreshed after our weekend off in the camp where we had good food and had lots of sleep to prepare for the next phase – we started the platoon phase. The platoon phase, like the section phase, was not very easy. On the first day of the platoon advanced to contacts, we were the last platoon to go through the range. We were in the midday heat and a lot of the area was on fire with smoke and flames everywhere. We ended the platoon phase with a deliberate attack which was very successful. The next phase was the company level phase. This phase was a lot harder as we had to think about what everyone else was doing in the plan to make it work. The first task was to establish a Forward Operating Base (FOB) just like the ones they use in Afghanistan. This was completely new for me, because it was my first time in a FOB, but I was really keen to learn about how we were going to do it. We established the FOB by building sangars and building up the defences, and then we started on FOB routine. I really learnt a lot about how an FOB works, and I think I have a good idea now of what we will have to do on operations in the future. After the FOB phase, we moved back into conventional tactics for the final attack. 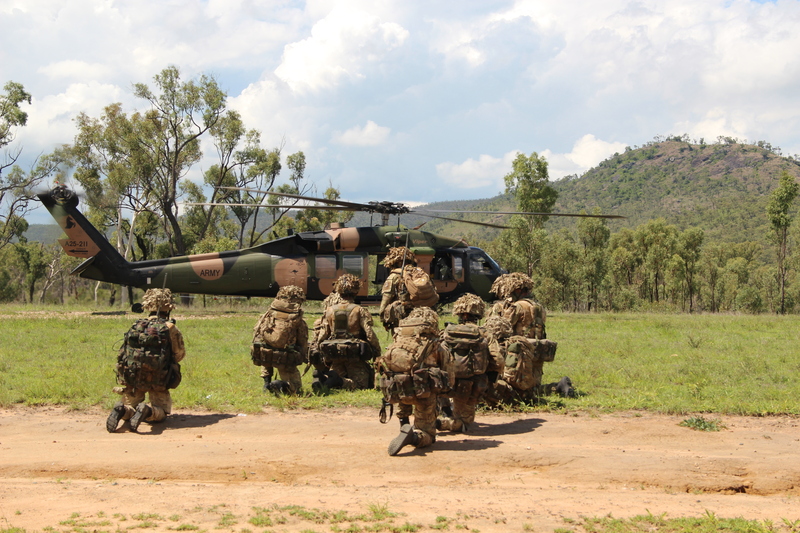 The final attack was a dawn attack that we conducted with the help of C Coy The 1st Battalion the Royal Australian Regiment (1RAR) who conducted the break into the enemy position. We held our breath on H Hr in anticipation, and then we worked continuously hard in the heat for over 3 hours. We had a special guest watching the attack that morning, as CO saheb and the RSM saheb had come from Brunei to watch us in action. When the final position had been cleared by 6 platoon, we heard over the radio “python python” which was the code word for the end of the exercise. We all took a deep breath of relief as we had finished after a whole month in the field. After completion of the attack the Gallipoli group had a photo taken with our CO saheb. performance. After post exercise admin was complete, we left in the coaches for Lavarack Barracks to start our 3 days R and R. Following R and R, we had a week long package of adventure training which provided us with four options. They were rock climbing, sea kayaking, river kayaking and scuba diving. Everyone had an excellent time and it was the best end to an excellent overseas exercise. I feel proud to have been a part of Ex PK as even though I have not been on operations, I think I have experienced some of the realities of war. It was really useful for me and everyone involved. Everyday was a learning day for us in Australia. To hear a BFBS interview with members of B Coy click on the link BFBS-Pacific Kukri.